This house is the perfect beach retreat for a large group and will handle 12 people with ease. Up to 8 people can sleep in own beds. Daily maid service is included, and we can arrange for pick up at the Puerto Plata airport for $35. A cook/nanny can be arranged on request . This house has become the favored place for groups of kiteboarders. The front lawn is a great place to set up and take down kites sand-free! There is a large equipment room for secure storage of kites and boards. Best of all, the beach in front is wide and less crowded than Kite Beach or Bozo Beach. Land your kite, come in for a cool drink and go back out when ready! Kiters' Paradise! The rate for the cook ranges from $10-20 for breakfast and $25-40 for dinner depending on the number of people. Groceries are not included. The house was as described. Right on the beach within walking distance from town but still far enough to not be overwhelmed. The place was clean and the service was great Opt in for the chef services so you dont have to stress about anything! Kites were in the air everyday and the place next door rented equipment at a fair price. One thing I do suggest is bring your own shampoo etc because there wasn't any in the house. Exactly what we needed in a vacation. Superb location and villa was excellent with a few minor issues. It took 3 days to have properly working fridge that made ice. This was important as we needed ice for our drinks. The TV was not working and after it was repaired, it still did not work. Cleaning and security staff were amazing. Please tip them as they do a wonderful job. Overall the villa and location was perfect. Erica was very helpful during our stay. Highly reccomend this villa if you have a large group. Stayed for 4 night over Christmas and couldnt have asked for a better experience. The location is amazing, the beach is gorgeous and there is plenty to do within walking distance of the villa. Absolutely loved it, just about as perfect as it gets!! There is literally nothing in the kitchen BUT plates, cups and silverware. You need to buy salt, pepper, ice, etc. AC in bedrooms works really well! Town- typical small beach town with lots of tourist shops and people wanting to sell you tours. 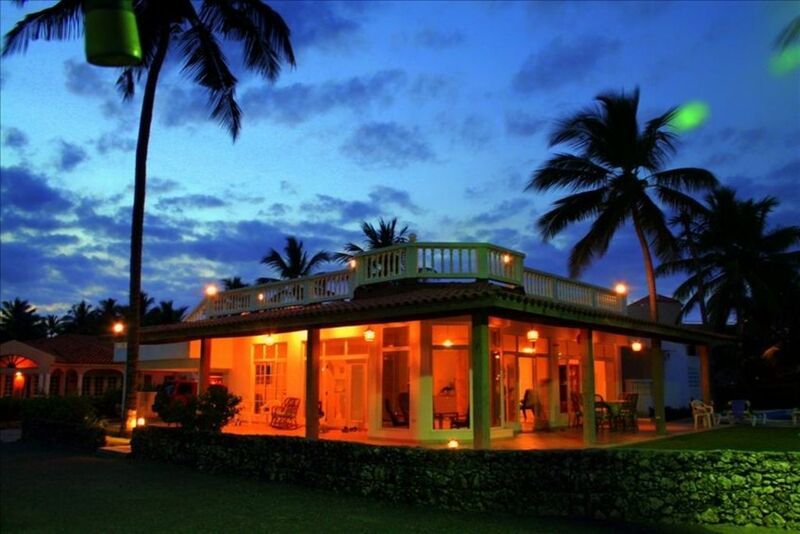 Cabarete is a great little area so we are happy we chose this house and this area for our first trip to the DR. The most important thing we learned is to fly unto Puerto Plata airport. We saved a little but of money flying into Santo Domingo but it cost us a full day of driving and was a super stressful drive. Fly in during the day. Bahia De Arena is the name of the housing development where the Villa is located and it's not super easy to see off the road. Fly in any day except Sunday as the office is closed and Erika ( works in the rental office) is really the person that can help your stay go easily. If you fly into Puerto Plata you can get a taxi to the house and then later rent a car in town if you feel you need it. Everything is in walking distance but it was handy to have a car to go get grocery's and to get to our day excursion destination. The next best person to know in town is Joseph who owns an excursion business next door to Iguana Mama excursion business. Use Joseph for your bookings and he can also give you much needed advice and education on restaurants and just getting around in the area. The House! Great house and you really can't beat the fact you have a pool and the ocean right in front of you. We enjoyed both every day all day. The house has 4 bedrooms and is very roomy. The main bedroom has what we would call a king size bed. The second bedroom has a queen. The third bedroom has 2 double beds and the kids room has 2 sets of bunk beds where our teenage sons all slept comfortably. The house is equipped with everything you need. The cleaning lady Jaqueline was very nice and good but speak no english so if you want her to do the laundry you have to let her know and we paid extra for this service. We tipped her $5.00 a day and then $25.00 at the end of our trip. The pool/yard man Morano is very nice and helpful and we tipped him $35.00 at the end of our trip. If you need anything extra from anyone let Erika know and she can communicate. We booked Illuminata as our cook for 3 nights. You can get the menu from Erika and Erika arranges. Grocery's cost about $30.00 for 8 people and we paid her $30.00 - $35.00 per evening she cooked. Her fish and sauces were amazing as well as the stew. Pass on desserts. She speaks no english so you need to let Erika know if you have an special instructions. Also if you state you would like to eat at 6:30 make sure she is at the house by 3 cooking. Late dinners every night.